I first discovered Clifton “Kip” Fadiman 30 years ago through a battered copy of his 1960 book, The Lifetime Reading Plan, found while prowling the stacks at Oxford Too, that beloved now-defunct used bookstore in Atlanta’s Peachtree Battle Shopping Center. Fadiman became one of the 20th century’s most public of public intellectuals after anti-Semitism kept him out of the academy. The head of the English department at Columbia noxiously informed him in the 1920s, “We have room for only one Jew,” and the seat was filled. Instead, Fadiman extolled the virtues of reading everywhere he could in the public arena, from books to newspaper essays to 10 years as book editor of the New Yorker. For nearly 50 years he served on the board of the Book of the Month Club, which played an outsized role in determining post-war America’s reading tastes. He was on the board of the Encyclopedia Britannica for 40 years and became one of its most public faces in that pre-Google age when it held unchecked authority for all things factual. In radio’s latter days and in television’s infancy he hosted a highly popular program called “Information Please” (not unlike NPR’s “Wait, Wait, Don’t Tell Me”), where he might ask the panelists to close their eyes and try to remember the color of their ties. He wrote countless forewords, anthologies, and book reviews, co-wrote the mammoth The Joys of Wine, and published four editions of The Lifetime Reading Plan before his death at age 95 in 1999. The Lifetime Reading Plan celebrated unashamedly the Western Literary Canon, though to his credit the 4th edition of the Plan, written with John S. Major, included for the first time many volumes of the Eastern Canon as well. Fadiman’s advice was sound: The Great Books could enrich our lives and help us “avoid mental bankruptcy.” Take your time, he advised: “They should not be read in a hurry, any more than friends are made in a hurry. This list is not something to be ‘got through.’ It is a mine of such richness of assay as to last a lifetime.” I’m still reading the books on Kip’s list and plan to have a bookmark in one on my last day. 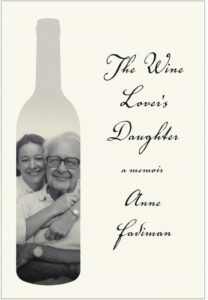 The Wine Lover’s Daughter is a moving tribute to Fadiman the father, reader, and yes, wine lover, from his daughter Anne, no slouch herself. Kip was enormously proud of his daughter and rightfully so. Her book The Spirit Catches You and You Fall Down won the 1997 National Book Critics Circle Award, and I devoured her collections of bookish essays, Ex Libris: Confessions of a Common Reader (1998) and At Large and At Small: Familiar Essays (2007). There’s much more about wine here than books (disappointing to this bibliophile), but we do learn that Kip read 80 pages an hour in his prime. No wonder he could read so many books. Tragically, his last decade brought near-blindness, but—reader to the end—he happily embraced the joys of audiobooks. After her father’s death—on Father’s Day, no less—Anne Fadiman lovingly scattered his ashes on “a few carefully chosen graves” in Concord, Massachusetts—those of Emerson, Thoreau, Hawthorne, and Bronson Alcott. It was a beautiful gesture, a fitting closure to the life of a Great Reader. This entry was posted in Books, Culture, People, Public History on April 26, 2018 by Stan Deaton.